Bertini Skaugam Begonia produces stunning red, single flowers that are perfect for container gardening. One bulb produces many blooms that will brighten up any shady spot in the garden. The Bertini Skaugum is to be grown in a hanging basket or pot. The bulbs are planted in spring and will bloom in mid to late summer. This begonia will produce many blooms that will cascade over the container it is growing in. Beautiful for any shady area in your garden. Gardeners in areas that receive frost will want to dig the bulbs up at the end of the season and store them for the winter. Tuberous begonias are hardy in zones 8-10 and considered annuals in zones 2-7. We recommend starting begonia tubers indoors in the late winter, around February or March. If starting indoors, place planted begonias in a warm location with indirect sunlight, preferably an eastern, western, or south facing window. If you don't have an indoor window space, you will need a heat lamp to allow some light for growth. However, tubers can be planted from February to June depending on your region. In areas with hot summer temperatures, it's best to have begonias established earlier in the season. In colder zones, tuberous begonias are tender and cannot be placed outdoors during frost. Come spring, once the ground warms and the chance of frost is over, bring your begonias outdoors and either keep them in containers or transplant into the garden. Prepare your garden bed or container. If planting in a garden, dig a hole a few inches deep to cover the tuber. 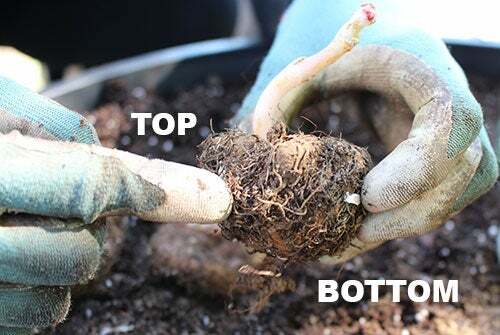 If planting in a pot, find a pot that is twice the size of the bulb. Fill the pot 3/4 full with potting soil. Choose soil mixes with peat moss, because they retain moisture and create slightly acidic soil. One side of the tuber has a hollow dip and the other is round. Place the tuber round side down. The hollow dip is the top, sometimes it will already be sprouting buds. If the buds are coming up, gently place the tubers in the pot. The new growth is fragile, so try not to bump or break it. Cover tuber with soil, and water around the bulb. Keep pot or garden moist, but not to wet. Too much water will rot your begonias. Expect growth in 3-4 weeks after planting. If growing conditions aren't ideal, begonias can take longer to grow. After begonias have sprouted and are a couple of inches tall, you can transplant if desired. If you live in colder climates and it's free of frost, you can place outside. After planting tubers water slightly every few days or when the soil dries out. Begonias will rot if over watered, it's best to keep their soil just barely moist. Always water around the tuber, not directly on it. Fertilize every other week with a 20-20-20 organic fertilizer. In the fall after the leaves turn yellow, and or temperatures reach below 40 degrees at night, bring your begonias inside and use as a house plant or save for next spring. Begonias will naturally begin to slip into dormancy by themselves. In colder zones dig up tubers once the foliage has passed and store in a cool, dry, non-freezing place until spring. Allow tubers to dry out for 5-7 days before storing to reduce mold and rot. It is best to place tubers in a cardboard box or paper bag full of peat moss. Make sure to label the tuberous begonias for the following season.